About the reviewer: Dr Jodi-Anne George is Senior Lecturer in English at the University of Dundee. Her research interests include Old and Middle English, mediaeval drama, palaeography, religious poetry and Hungarian literature. She has edited such publications as Bahram Beyza’i: ‘The Marionettes‘ (Salzburg: Poetry Salzburg, 2005), Geoffrey Chaucer – The General Prologue to the Canterbury Tales: A Reader’s Guide to Essential Criticism (Palgrave Macmillan, 2000) and has written Beowulf: A Reader’s Guide to Essential Criticism (Palgrave Macmillan, 2009). 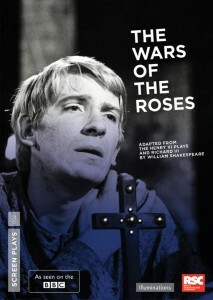 First performed on stage in 1963, The War of the Roses was in many ways the production that came to define the newly-formed Royal Shakespeare Company. Masterminded by Peter Hall and writer and co-director, John Barton, this hugely ambitious adaptation recalled Orson Welles’s earlier stage play Chimes at Midnight (1960) in its scope and audacity. In order to reshape four of Shakespeare’s history plays – the three parts of Henry VI, which were often considered unwieldly, if not unperformable, and the far better-known Richard III – into a trilogy, Barton made substantial cuts, but also added several hundred lines of his own. The plays were subsequently staged in Stratford-upon-Avon, on a set designed by John Bury, resemblinh a giant steel cage. The cast comprised theatre stalwarts such as Peggy Ashcroft and several newcomers including David Warner, Ian Holm and Janet Suzman.